Good foods vs. Bad foods. And my shocking snack last night. I’m always amazed at what people set up in their minds as “good” food and “bad” food. “Healthy” food and “guilty” food. “Lean” food and “fat” food. For some, bread is bad. And anyone who could possibly eat bread isn’t very healthy. For some, eggs are bad. And anyone who could possibly eat eggs isn’t very healthy. For some, meat is bad. And anyone who could possibly eat meat isn’t healthy. For some, alcohol is bad. And anyone who could possibly drink alcohol isn’t healthy. For some, carbs are bad. And anyone who could possibly eat carbs isn’t healthy. For some, soy foods are bad. And anyone who could possibly eat soy isn’t healthy. And the list goes on…and on…and on. There’s no such thing as a bad food. A few things really amaze me when it comes to this mentality. First, very, very few foods either qualify as good or bad. As I mentioned in a post just yesterday, it’s important to note that most foods don’t really carry an inherent “goodness” or “badness” in their chemical structure. Instead, it’s our own physiological environment that sets the stage for how the food reacts within our bodies. For example, if you’ve got kidney disease, a high protein intake is probably really bad for you. However, if you’ve got healthy kidneys and you regularly exercise, a high protein intake is probably pretty good for you. Likewise, if you’ve got liver disease, alcohol intake is probably really bad for you. However, if you’ve got a healthy liver and borderline high cholesterol, moderate alcohol intake is probably pretty good for you. Now, make no mistake. Some foods offer little physiological value. Like trans fats and other artificial foods, artificial additives, and artificial ingredients. And even with 100% natural foods, gross overconsumption isn’t a solid idea either. Take the vegetarians who eat soy as their only protein source through the entire day. Or take the bodybuilders whose protein consists of canned tuna for the 16 weeks leading up to a contest. Sure, tuna and soy foods are natural. And eaten in moderation, can contribute to a healthy diet. But, keep in mind, there’s always that moderation thing we must contend with. Too much of anything, even a good thing, can become bad in a hurry. But only if it’s healthy. So, if you stick with natural foods (that you’re not allergic to) and eat them in moderation, the body does a pretty nifty job of processing them and doing the right things with these calories. But only if it’s healthy. For example, in the environment of a Precision Nutrition body, whole eggs may be quite beneficial. This is because the eggs are introducing the following to a healthy, well-functioning physiology. some cholesterol for optimal hormone production. However, while in the environment of an unhealthy body, eggs may be harmful. This is because the person’s cholesterol levels may already be high, their dietary fat intake is probably way out of balance, they may be overweight and requiring fewer calories, and their insulin levels are high from too many carbohydrates and sugars, forcing that fat into fat cells rather than it being burned for energy. In addition, the liver may be damaged and may not process the cholesterol appropriately. Further, their GI tract may be damaged and poorly absorb the protein – or absorb the protein undigested – and either scenario is not so good. So you see, same egg, different consequences. Meaning that it’s not the egg, per se. It’s the environment that the egg’s proteins and fats are introduced into. It ain’t the egg’s fault. In the end, with the myriad factors that go into how a food behaves in your individual body, it’s important to look at food in a different way. Rather than suggesting eggs=bad, or any other food=bad for that matter, it’s important to start to ask ourselves whether we’ve taken care of the things we can to ensure that whole, natural foods contribute to our health. In essence, it’s high time we stopped looking for scapegoat foods and instead, started taking responsibility for the poor care we take of ourselves. Most of us don’t exercise enough. Most of us don’t sleep enough. Most of us don’t play enough. Most of us don’t pray (or whatever other meditation you do) enough. Most of us don’t eat the right balance of foods often enough. And most of us don’t stop eating before we’ve eaten too much. No surprise that eggs, butter, meat, bread, pasta, rice, and many other foods are getting a bad rap. In the type of physiological environments we dump them into, and in the amounts we’re dumping, of course they’re not helping matters. And no wonder plant-based diets are getting so popular. Plants have a host of medicinal benefits. So they can help us remedy some of our lifestyle problems discussed above. And that’s great. However, what if we stopped misusing our bodies? Maybe we wouldn’t need to shun so many foods. Maybe we wouldn’t have to treat our diseases and disorders with a ridiculously high number of plant foods. Maybe we’d then be able to eat a more diverse selection of foods while achieving even greater health ends? 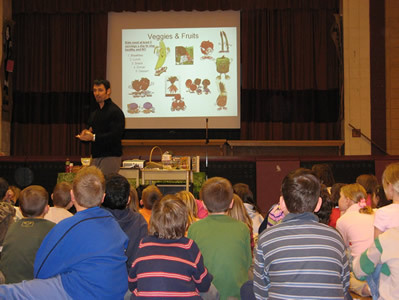 From time to time, I speak at grade schools on the topic of nutrition. And in my workshops, seminars, whatever you call it when you’re speaking to grade school kids, we play some food games. Interestingly, not only do these games help teach the kids about food. They also give me some powerful insights into how they actually think about food, how they view food, and how they actually eat. And from these insights, I’ve learned that children have a pretty simple view of food. Kids don’t really have any sense of amount. Nutrient timing wouldn’t be a good lesson for them either. And they don’t quite understand the idea of conditional benefits – you know, the idea that something can be either good or bad depending on when it’s introduced. And that’s fine. I can work with it. After all, they’re 7 years old! However, it’s awfully disconcerting when I see 39 year olds at the same level of nutritional thinking. Oh yea, I see it every day. And wow – it’s shocking to know that these folks haven’t progressed beyond this 3rd grade level of thinking. Indeed, it’s high time we stop thinking so simplistically about food. Again, it’s rarely the food (especially if it’s a whole, natural food) that’s problematic. It’s our own environments. It’s the physiology we dump the food into. Fix your environment with the right amount of exercise, the right amount of sleep, the right balance of fruits and veggies, lean proteins, and healthy fats, and life that includes active relaxation strategies. Do this, and almost any natural food fits right in to your diet. No calorie counting required. Not deprivation and depression. No food cravings and obsessions. Just a healthy relationship with your body and with your refrigerator. At this point, I’d like you to take a look at this “shocking snack” I served to my friends last nite. Yes, there was alcohol. Yes, there was cheese. Olives in olive oil, chocolate, pepperettes, bread, and peppers were also included. You see, in their minds, many of the foods on this tray were decadent or off-limits for a “health paragon” like myself – a guy with a perfect blood profile and a body fat percentage under 10. Well, I hated to disappoint them, but I eat like this all the time. I have about 3-4 glasses of red wine each week. I eat organic olives and olive oil every day. In addition, the goat’s milk cheese (hormone-free), pepperettes (from grass-fed bison), bread (whole grain artisan bread with olives), and chocolate (100% cocoa) are all part of my weekly fare. There’s a great dose of protein and important vitamins and minerals in the cheese and bison. Plus, since they’re grass-fed and free of hormones, I’m not getting tagged with hormones, antibiotics, and an omega 6 overload. The peppers provide a few colors (yellow, orange, and red) for my veggie intake. And we all know that when there’s a protein on the plate, there’s gotta be some veggies. The wine is loaded with healthy polyphenols and the anti-aging compound you hear so much about today – resveratrol. In moderation, wine is a great drink for promoting health. The olives (and the vinegar+oil marinade they’re soaking in) provide a nice dose of monounsaturated fat to help balance out the saturates in my cheese and bison. And the vinegar helps slow carbohydrate absorption into the blood. The 100% cocoa chocolate provides a rich source of antioxidant polyphenols and these have been shown to offer a host of health benefits. The bread was a better choice than most highly processed breads and was placed on the tray for 2 reasons. First, I had just worked out a few hours prior and still was in my higher carb tolerance window. Secondly, my natural body type requires moderate to higher carb intakes. Plus, the meal tasted freakin’ great, I enjoyed it in the company of great friends, and we ate it while socializing, story-telling, and laughing. Indeed, if that ain’t a healthy combo, I don’t know what is. Great tasting food that’s good for you. Interestingly, just the other day, my PN colleague, Ryan Andrews, shared an important lesson that spoke to this point. One PN member was talking about how he just “blew his diet” with pizza. The member also mentioned that he often “blows his diet” with pizza. After this admission, Ryan asked the obvious. Why didn’t he just make something like the Chicken Pesto Pizza from Gourmet Nutrition? 1/3 of the calories of a regular pizza, loaded with veggie goodness, lower in carbs than most pizzas, and full of protein, this pizza is freakin’ fantastic tasting but doesn’t “blow your diet.” Instead, it’s part of your normal diet. Similarly, my “shocking snack” above is like the Chicken Pesto Pizza. It’s full of nutritional goodness. And it tastes awesome. However, make no mistake. There’s a slippery slope here. Let internal justification and rationalization kick and you’re in trouble. Replace the wine with Red Bull and Vodka, the pepperettes with fatty salami, the 100% chocolate with milk chocolate, and the artisan bread with white bread, and you’re on a slippery slope. Too much sugar, too much caffeine, too much saturated fat, and too many total calories might ruin your physique. Looking at food in a good vs. bad way is overly simplistic and will lead you to poor decision making and a lot of confusion. Instead of trying to stay away from bad foods, try this instead – eat mostly foods that are minimally processed and eat a wide variety of them so that you never obsess too much on any single natural food. Complement your natural food diet with proper rest, exercise, and play so that your physiology is prime for eating a healthy amount of great-tasting, natural food. Now, let’s be clear. 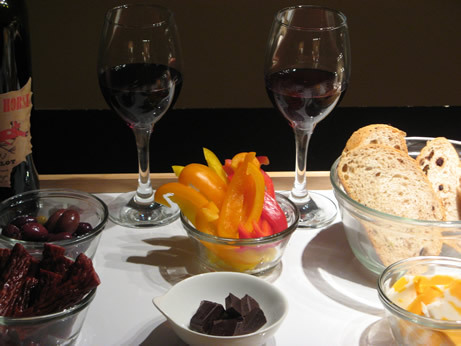 I’m not interested in convincing you to eat meat, cheese, bread, olives, and chocolate. Nor do I want to convince you to start drinking wine. Nor do I care if you start making healthy pizzas. These are all EXAMPLES. Instead, I am interested in reminding you that good nutrition isn’t that complicated. It just takes a little thought, decision-making, and perspective. And when you lose your perspective, that’s when you get a little food paranoid. You start convincing yourself that certain foods are off-limits if you want to be lean, healthy, and perform at a high level. You start setting up a restrictive set of rules in your mind that doesn’t need to be there. You start judging yourself harshly when it comes to eating related decisions. You start thinking in black and white (like a 3rd grader) without noticing and embracing the shades of gray. But here’s the great news. It’s not to late to make a change. It’s not too late to forge a more healthy, mature, and reasonable relationship with food. Is it your time to become your healthiest, fittest self?